Like all living things, trees can get sick. Though they may not have a sniffle in their nose or a sore throat, their illnesses present in ways that make them weaker and their blooms less appealing, if they are able to bloom at all. 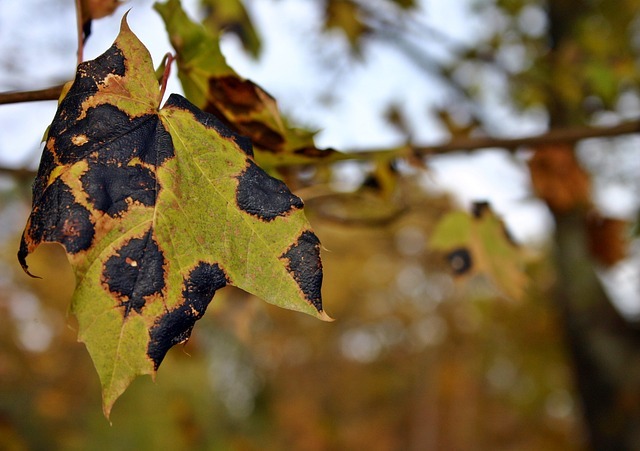 Today we’re going to be talking about common tree diseases and how you can spot them in the coming year. Let’s take a look. Anthracnose is a disease that can affect many different trees and it affects them in various ways. It can even spread to shrubs and flowers. For the most part, it affects leaves, fruits, and twigs on the trees it attacks. The symptoms of this disease range from defoliation, branch dieback, and even a complete tree death. Anthracnose is a fungus, and thus will be dealt with accordingly. Rosaceous plants like hawthorne and crab apple can fall prey to cedar rusts. You will commonly see this fungus develop in the form of yellow and orange spots that appear on the leaves of your trees. This disease spreads through juniper branches and when trying to control it, it’s best to go to the source. When you address the juniper spores, you can help to curb the outbreak. You may notice a strange powder appearing on the leaves of your trees. This may be powdery mildew. Like the other diseases we’ve mentioned, this is also a fungus. Though it may only start as a small cosmetic issue, leaves can get dry and brown as the infection gets worse. Finally, it can be lethal. To keep your trees from developing this problem, avoid planting them in shady areas and make sure that your plants aren’t too close together. AS a rule of thumb, fungus likes areas that are cool, moist, and dark. So, avoid creating the perfect place for them to thrive. If your trees look like they may be facing illness, then call on the experts at Nelson Tree Specialist. We can come out, take a look, diagnose the issue, and treat it so that your trees can continue to lead happy, fruitful lives. Contact us today to learn more about how we handle tree illness. We look forward to serving you. This entry was posted on Wednesday, January 2nd, 2019 at 12:24 pm. Both comments and pings are currently closed.